Central Selection Board (CSB), BTC. 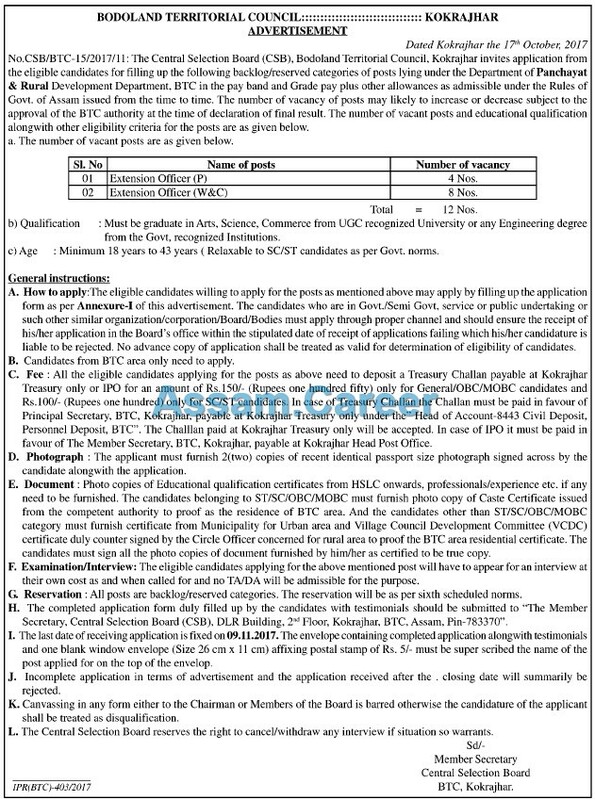 The Central Selection Board (CSB), Bodoland Territorial Council, Kokrajhar invites application from the eligible candidates for filling up the following backlog/resented categories of posts lying under the Department of Panchayat & Rural Development Department, BTC in the pay band and Grade pay plus other allowances as admissible under the Rules of Govt. of Assam issued from the time to time. Educational Qualification : Must be graduate in Arts, Science, Commerce from UGC recognized University or any Engineering degree from the Govt. recognized Institutions. Application Fee : All the eligible candidates applying for the posts as above need to deposit a Treasury Challan payable at Kokrajhar Treasury only or IPO for an amount of Rs. I50/- (Rupees one hundred fifty) only for General/OBC/MOBC candidates and Rs.100/- (Rupees one hundred) only for SC/51' candidates. In case of Treasury Challan the Challan must be paid in favour of Principal Secretary. BTC, Kokrajhar. payable at Kokrajhar Treasury only under the" Head of Account-8443 Civil Deposit, Personnel Deposit, BTC". The Challlan paid at Kokrajhar Treasury only will be accepted. In case of 1PO it must be paid in favour of The Member Secretary. BTC, Kokrajhar, payable at Kokrajhar Head Post Office. How to apply: The eligible candidates willing to apply for the posts as mentioned above may apply by filling up the application form as per Annexure-1 of this advertisement. The candidates who are in Govt./Semi Govt. service or public undertaking or such other similar organization/corporation/Board/Bodies must apply through proper channel and should ensure the receipt of his/her application in the Board's office within the stipulated date of receipt of applications failing which his/her candidature is liable to be rejected. No advance copy of application shall be treated as valid for determination of eligibility of candidates. The completed application form duly filled up by the candidates with testimonials should be submitted to "The Member Secretary, Central Selection Board (CSB). DLR Building. 2nd Floor, Kokrajhar, BTC. Assam, Pin-783370". Photo copies of Educational qualification certificates from HSLC onwards, professionals/experience etc. if any need to be furnished. The candidates belonging to ST/SC/OBC/MOBC must furnish photo copy of Caste Certificate issued from the competent authority to proof as the residence of BTC area. And the candidates other than ST/SC/OBCIMOBC category must furnish certificate from Municipality for Urban area and Village Council Development Committee (VCDC) certificate duly counter signed by the Circle Officer concerned for rural area to proof the BTC area residential certificate. The candidates must sign all the photo copies of document furnished by him/her as certified to be true copy. The last date of receiving application is fixed on 09.11.2017.The envelope containing completed application along with testimonials and one blank window envelope (Size 26 cm x II cm) affixing postal stamp of Rs. 5/- must be superscribed the name of the post applied for on the top of the envelope.